Bought this ring for myself, and I /love/ it! It's like wearing a very unique work of art on my hand. It is very pretty and well made. I get compliments on it whenever I wear it. This seller ships super fast, and the package the ring arrived in was beautiful. Thank you! I got this for a friend as a gift, and it is so beautiful! It's a really unique piece and was very well received--my friend loved it so much. The color was a really pretty red, and the electro-form added to the unique look! The seller was very accommodating, too. I asked to include a special note and specified that this was a gift, and she made a very pretty package for my friend. Thank you! This bracelet did not disappoint. It is stunning and the workmanship is of excellent quality. The gorgeous elements drew me in and I could not put it in my cart fast enough. So happy to have this. It has turned me into a bracelet wearer. The seller is wonderful to do business with! 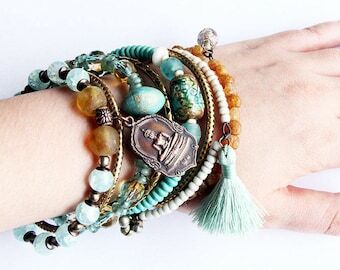 New artisan Bohemian bangles just added to the shop! 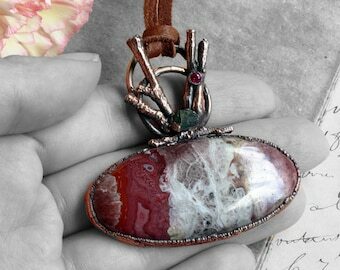 Two spanking new electroformed necklaces now available! Lots of rustic charm and uniqueness! Moon Fragments collection, Celestial inspired and fabricated from scratch. Day of the Dead inspired jewelry. Skulls pervade my creations as I love memento mori Victorian jewelry. Every year I make a point to learn a new technique. Electroforming copper allows me to humbly set Nature's creations. Designing is a big part of my work, when I'm not at the bench I'm at my assemblage table arranging and rearranging. I've been an artist all my life and a trained professional artist for the past 15 years. I've studied painting, sculpture and many other disciplines. Although, I've focused my efforts on painting and sculpture, I started making jewelry in 2011 first assembling old parts and bringing them back to life. It wasn't too long before my desire to make my own jewelry from scratch grew stronger. Fast forward a couple of years and I'm taking metal smithing classes on-line and in person with several fantastic teachers of widely different background. inLumina is another aspect of my artistry and it is a one-woman deal. The word Lumina is the plural form of the latin word "lumen" which means light, candle and star. In a way I believe when I create, I'm inside the light of my life journey and it's the most blessed place to be. I believe the act of creating to be the ultimate enlightenment. My themes vary, but always somehow center around the celestial, spiritual and natural world . They are often executed in what I like to call a Victorian Bohemian fashion. You can expect to find ornate gothic memento mori inspired creations, rustic jewelry in the spirit of Bohemian and romantic decadent pieces filled with whimsy. Metal Chick - Here you will find my one or a kind or limited edition metal smithed jewelry completely made from scratch by yours truly. A bit trendy and a bit Bohemian, for the awesome chick you are! Vintage Rocks - My love for the vintage look will never cease. 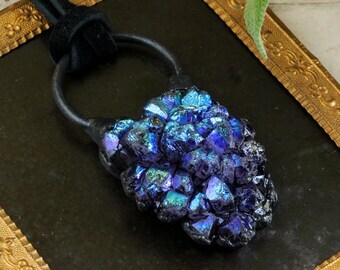 Normally this jewelry is made to look like vintage, but often it does include some vintage parts that are straight from old factories along with new findings and every once in a while if my head tells me so, you'll find a true heirloom one of a kind piece made from really really old, like antique parts. Up-cycling is not only chic but environmentally conscious. Noir - If you have Gothic tendencies, but you're also a hopeless romantic, you'll find this black jewelry very appealing, plus black is fabulous and timeless, like you! Boho Gal - That's what I am at heart. A Boho Gal with a rustic and tribal edge. Modern designs, trendy but with that bit of magical wear and rusticity. I hope you'll find something that suits your personality. I use a variety of metal fabrication and non fabrication techniques across all my work. Oh and by the way, I insist on finding parts that are ethically acquired. Good Karma is always in style! Sign up for my newsletter at http://eepurl.com/bhPgIL for monthly news and subscriber's benefits. If I'm not dreaming, I'm daydreaming with a brush or hammer in my hand. -Items $50-$99 may be put on layaway with a 50% non refundable deposit and paid in full by 30 days. -Items $100-$200 or more may be put on layaway with a 25% non refundable deposit and paid in full by 60 days. -Items over $200 may be put on layaway with a 25% non refundable deposit and paid in full by 90 days. If you need more time for larger orders or more expensive items, please contact me to arrange. Custom orders vary in time for production, please contact me for arrangements. Once a custom order is placed I ask a non-refundable 50% deposit in advance with the remaining balance due according to the layaway payment parameters (see question on layaways). I will help you design your piece, until we reach an agreement. I will provide sketches or pictures of in-progress work if necessary. Why are my black copper items turning back to copper? Unfortunately there is no way to keep a patina forever on any kind of metal. It can be reapplied and sealed but the copper will alway resurface with wear. If you wish for me to reapply the patina, please send the item back to me with return postage and I will reapply and seal the patina. What can I do to keep my silver bright? Sterling silver has a tendency to tarnish with wear. To minimize the tarnishing process, you can wipe your ring with a soft cloth and place it in a ziploc bag. At some point you silver will dull, fortunately there are some cloths that are called "sunshine cloths" that will revive your silver like it's new. I currently do not sell or provide them, but I hope to provide them in the future when I offer more silver items. I insure all orders in the U.S.A. free of charge, if you need to return an item, please add insurance as well. If the item arrives damaged and was not insured, it will not be refunded. I do not post insurance for orders overseas. If you would like insurance, please contact me and we can arrange fees. Why do I see imperfections in some of your work? I often make imperfections part of my work, especially if I work with vintage parts. I find patinas, verdigris, tarnish and wear fascinating, as they tell a story about the piece itself. I also like to make some of my pieces that I make in silver or copper look aged and organic as I emulated those very things I love. Time and wear tell a story, my jewelry is meant to look "lived". If you have concerns, please contact me.